MY theory on machine quilting is this: You can’t quilt with out thread so of course it is included in the price!! I also have always charged a thread charge. I have never had any customers ever complain about it at all. I have figured the cost of making a quilt about six different ways, and they all come to within $20 dollars of each other, so I’ve gone to the 10 cents a square inch method, then I round up or down (depending on the quilt) to get an even number. It really doesn’t matter what you paid for the fabric you used in the quilt, you still have to replace it at today’s prices. Regarding adding the cost of thread to your quilting jobs, that is a question I’ve pondered and struggled over. I charge what the other ladies in our town charge, which is $30 per hour beginning the moment I start working on the quilt. 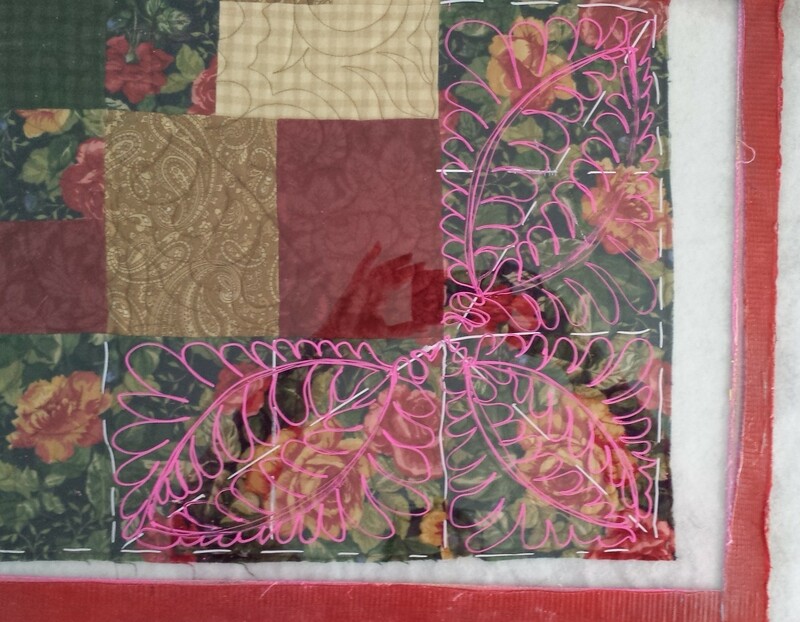 That includes loading time, quilting time, and, if necessary, correcting & ironing time and piecing the backing time. My customers know they can save a bundle by bringing me the back pieced and the top correctly pressed. I can knock out an over-all free motion pattern on a lap quilt for between $50-$75. They know that if they want a more intricate pattern it will cost more. I’ve been adding the cost of the thread to their expense, but I purchase smaller spools and give the left-over thread to the customer. I’m never too sure if that should be included in the $30 an hour. Do you charge tax on the thread or batting as it is not a service, but a what? Not a product. I don’t know where you are located, but here in WA State, machine quilters are considered manufacturers. And, as a manufacturer, I am required to charge sales tax on the WHOLE, COMPLETED project, including my labor, thread, batting, backing fabric, etc. Because of this, I purchase most of my supplies at a wholesaler (E. E. Schenck, Portland, OR http://www.eeschenck.com) where my purchases are tax exempt. When I can’t purchase supplies at a wholesaler, I get (business) tax-exempt status from the companies I purchase the other items from. FWIW – in most Western States machine quilting is considered manufacturing and you need to check with your own State. If you call your State’s Department of Revenue, they should be able to help you. It’s the same in PA. Yes you tax it all. I charge $10 for thread – to every customer, period. I recover the cost of my investment, and maybe make a little extra. No one has ever questioned it. Love these helpful hints and articles! Keep em coming Cindy!